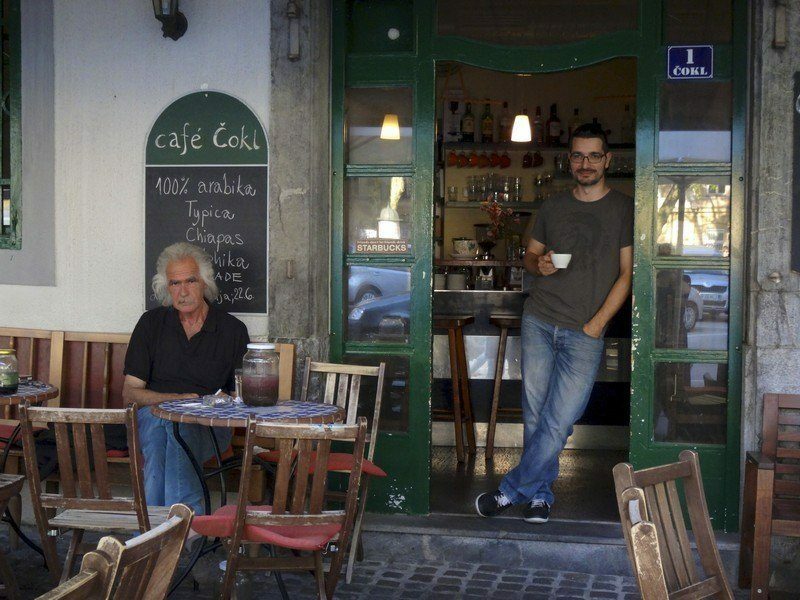 This is part of a series of interviews with inspiring travelers. Today’s interview comes from Katherine Larson about the Ljubljana Foodwalk Tour. All photos provided by Katherine. See more about tours and tour reviews here. Tell us about yourself and your travel experience. I’m Katherine and I have a passion for travel, love going on adventures and taking photos. I’m originally from Boulder, Colorado, and Boston is now my adopted hometown. I’ve been traveling since I was 9 years old – it all started on a family trip to Maui, Hawaii and that trip to the tropics got me curious to explore other places around the world! When college came around, I was fortunate to be able to study abroad several times while attending a hospitality university in Providence, Rhode Island. I spent a few months in the Spring each year to study abroad in Gothenburg, Sweden; Sevilla, Spain; Luzern, Switzerland and had the opportunity to work at a hotel in Costa Rica one summer – all unforgettable experiences that helped shape my career in the travel industry today. Now that I’ve been living and working in Boston for a few years, I save up most of my time off to go on vacations to Europe independently or with a tour company based on destinations I read about in my favorite travel blogs or find out about through social media. My favorite places I’ve been to in my recent travels are Bosnia & Herzegovina for its natural beauty and diversity, Dubrovnik, Croatia for its picture perfect views, wide range of activities and ease of getting around, and Warsaw, Poland for its deep history and mix of new and old sites and architecture in the city center (oh, and the cherry waffles that can be bought on the streets of the old town!). Where did you go on your tour and how long was it? How many food stops were there? I took the Ljubljana Essentials food walk which lasted around 5 hours and included 5 stops. What tour company did you use and why? I went through Ljubljananjam as they had the most variety of food walks and the reviews on TripAdvisor were outstanding. I actually found out about the food walk through Twitter when searching #Ljubljana, which lead me to check out their tours on their website and book one! Read more about how to pick the perfect food tour. Why did you choose a tour instead of traveling independently? I chose this tour because I knew I wanted to experience Ljubljana through a local who would be able to show me the best of the city through the food in a few hours, and this food walk did exactly that. I went on this tour just a few hours after checking in to my hostel and it was a perfect intro to Ljubljana and its up and coming culinary scene! What did you like about the Ljubljana Food Tour? What was your favorite part? Oh there is so much I loved about this tour! Iva’s knowledge of Ljubljana and Slovenia – I loved that Iva was extremely knowledgeable about the 5 hand picked places she brought us to and how I felt like I could ask her anything – whether it was about the horse salami we were eating or about the her favorite places in the city. Organization of the food walk – It was organized well so we tasted a variety of dishes from vegetable lasagna, Slovenian cheese and horse salami, gelato, to chocolate cherry cake all at unique cafes, restaurants and bars in different areas of the city. Not only did I get to try so many dishes I would have never thought to order, I felt much more oriented around the city after this tour! Stories from the back of the house – At every place we visited, the staff there would come out to talk to our group and explain what we were eating and its importance as a Slovenian dish. On top of Iva’s knowledge, it was and unexpected added layer to the food walk that added a more personal touch I couldn’t have experienced just going to one of the restaurants on my own. It was evident that everyone we met was prideful of the dishes they provided us. Size of the group – There were only 5 of us, which made it a welcoming environment for everyone to get to know each other and exchange stories. See why group size matters on a food tour. My favorite part of the tour was the last stop at Hedonia wine and culture shop in a basement a bit further out of the main city center. 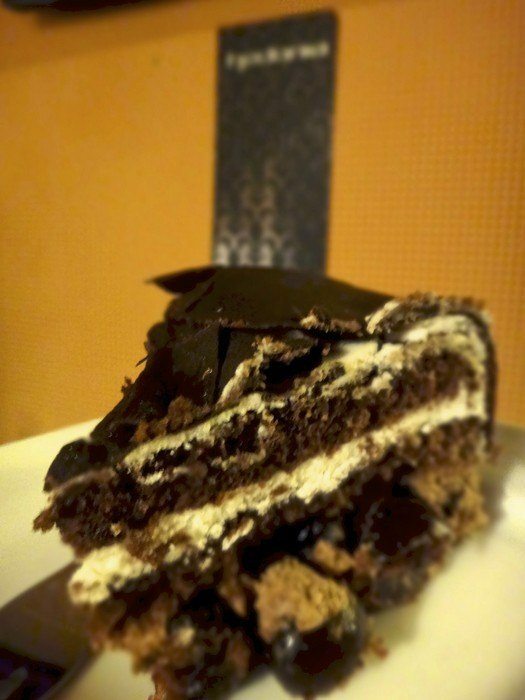 I still remember the sweet but not overbearing chocolate cherry cake – as a sweets lover myself, I was in heaven and any chocolate lover would think it’s to die for! We paired that with orange wine, which until that point I wasn’t aware such a thing existed, but it does. Instead of using red grapes in the process, white grapes are used. I was psyched to try this, although since it is an acquired taste, I didn’t care for it. Although I am glad we had the chance to try it as it’s certainly a unique wine and I have no idea when I’ll run into orange wine again. 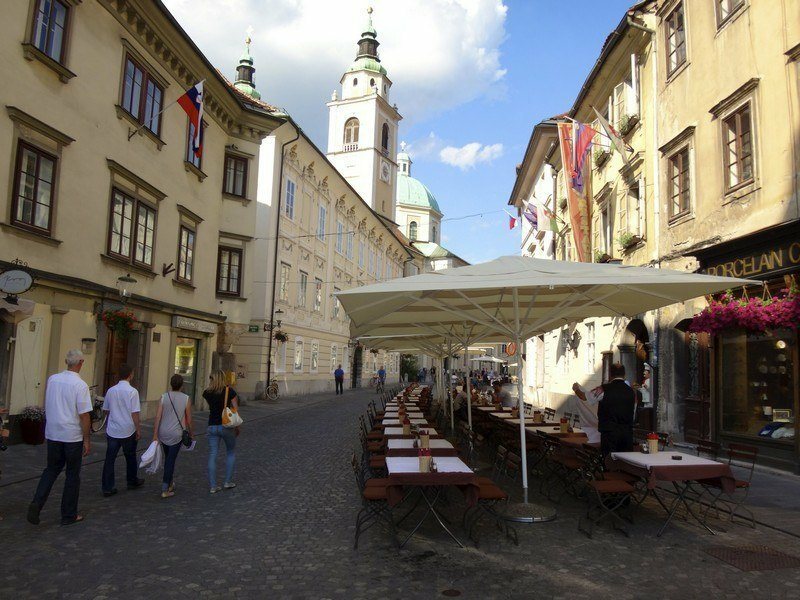 What did you learn about Ljubljana or Slovenia from the food tour? The Slovenes are welcoming and friendly people who seem to genuinely want you to enjoy your stay in their country. On every encounter from the tour guides, restaurants, to the hostel I stayed at, I found some of the friendliest people on my travels there. Through walking from place to place there, we came across quite a few dragon statues around particularly near the Dragon Bridge. They’re the symbol of the city and represent power. Was there anything you didn’t like about the tour? I really cannot think of anything I didn’t like! What was your favorite food on the food tour? The apple cinnamon with Slovenian cream cake ice cream (famously called the “kremsnita”) and the chocolate cherry cake were my favorites. Can you tell I’m a sweets lover? 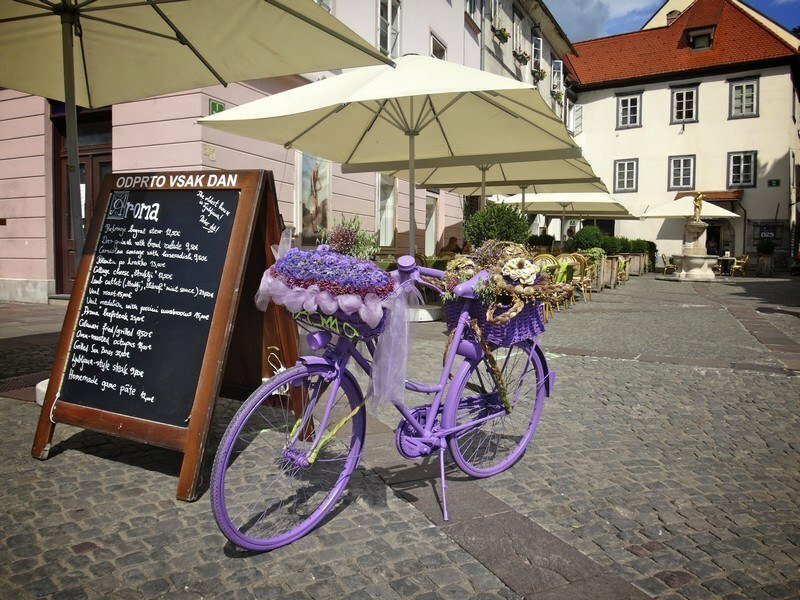 What inspired you to take the Ljubljana Foodwalk tour or travel to Slovenia? A couple years ago browsing the internet I had stumbled across a post where Ljubljana was named one of the best small cities in Europe – and I was immediately drawn in as I love smaller towns in Europe. Once photos from the old town and the ever so picturesque Lake Bled covered my computer screen while browsing, I knew I had to make it a point to get there! A few months later I had booked a G Adventures tour that was departing from Zagreb, Croatia and knew I had to find a way to fit Ljubljana into the itinerary. Seeing that Ljubljana is a brief 3 hour train ride from Zagreb, I was determined to make this work! So, I flew from Boston to Ljubljana a couple days before taking the train to Zagreb, and couldn’t have been happier to start my European adventure in this city that’s one of Europe’s best kept secrets. Would you recommend this tour? Would you change anything about it? Absolutely! This was easily the best activity I did in Ljubljana and I can’t imagine a better intro this charming city. We had the chance to experience a mix of cafes, restaurants and bars that I would have walked straight past had I not been on this walk. One tip – be sure to do this food walk at the start of your time in Ljubljana because you’ll undoubtedly come across many places you’ll want to know about for the rest of your stay! 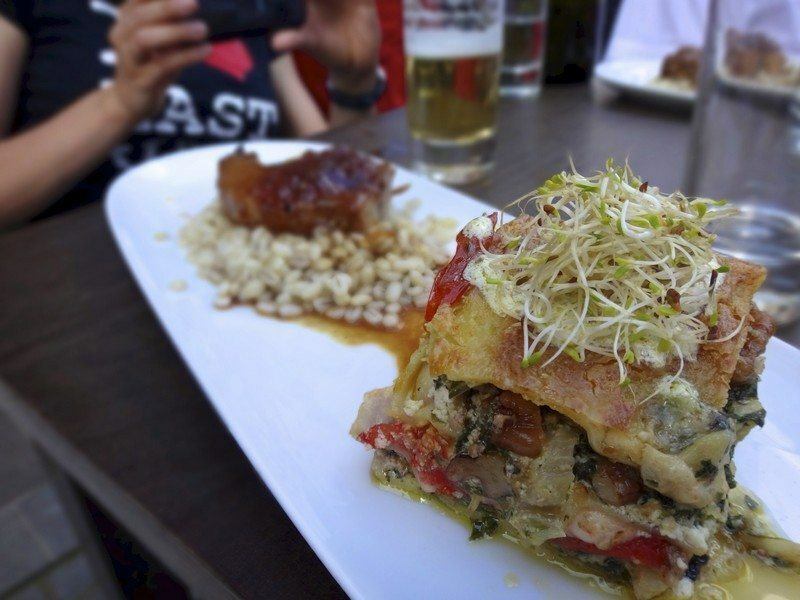 Do you think the Ljubljana Foodwalk tour would be good for a new traveler? Why or why not? This tour would be a great fit for a new traveler. Everything on the tour is organized and it is a tour with a relaxed pace. With a limited group size, it’s perfect to meet other travelers from around the world and share in conversations while trying all the dishes you never knew to order, but will love. Bio: Katherine is an avid traveler from Colorado living in Boston. Her favorite things include taking photos, hanging out with her boxer dog and planning new adventures. She is a social media enthusiast, is always up for conversation, loves to laugh, and meet new people especially when traveling abroad. You can read more about her travels at www.katherinelarson.tumblr.com/ and follow her on Instagram and Twitter. Going to Ljubljana? Click here to book a tour with Ljubljana Foodwalks or read reviews on TripAdvisor.